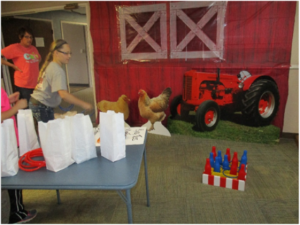 We had a variety of fair foods over the week, as that is a huge part of the fun! We sampled funnel cakes, cotton candy, lemonade shakes, fried candy bars, etc. 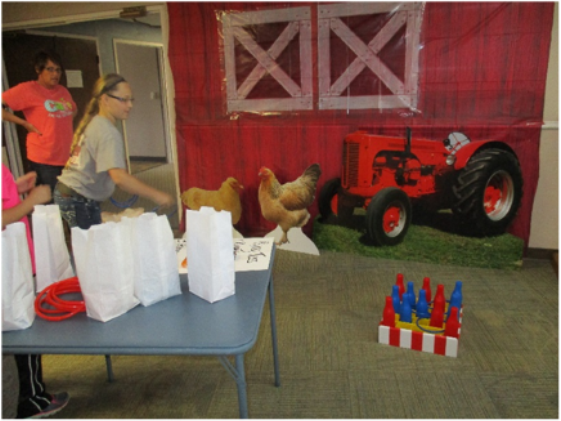 The 3rd Grade Class joined us one morning for carnival games, including duck pond, fishing, prize wheel, bean bag toss, and ring toss. They collected prizes (gift certificates for ice cream, toys, food) and had sacks and juice boxes before heading back to school. After the kids were finished, our ‘big kids’ took their turn with the fun! Fran Lowe gave a program and led reminiscing about the Winfield Fairs held on this site in the early 1900’s. Rhonda shared info on the New York World’s Fair another morning, finding that some of our residents had actually attended the event. Our annual Variety Show was held Wednesday afternoon, with many of our staff and residents taking part. The audience then voted for their favorites, with monetary prizes awarded to Shelby Hartman for first place (vocal selection), Loretta White for second (hair dresser skit), and Rhonda Connop and Brenda Spray for third (dog park skit). This is always a fun event and we are amazed at the talent (?) our family possesses! Jason Burgus again provided and cooked fish for a Community Fish Fry on Thursday evening. Abby Tuttle and crew made baked beans, potato salad, broccoli salad, chips, cookies, drinks and more to round out the delicious meal. We were pleased with the turnout of family and friends who joined us for the event. An artist came in that evening to add to the fun with face painting. Kids – of all ages- were sporting colorful works of art. 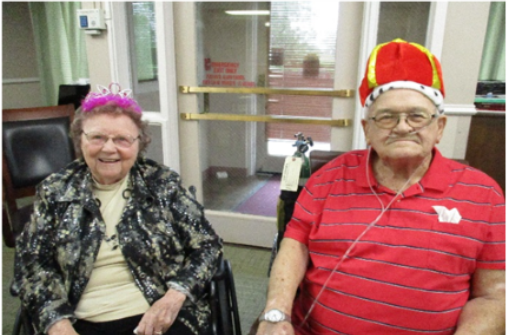 Other events included Happy Hour, Bingo, an ID contest and more. We are so fortunate to have a TEAM here that work well together to make these special events run so smoothly! The Winfield – Mt. Union 3rd grade class came to enjoy fair games! 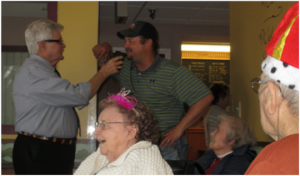 Thank you to Paul Dennison and KILJ radio for the live broadcast during our 5th annual National Nursing Home Week Fish Fry. Eloise Hill and Claire Curtis, our King and Queen, took their turn with the microphone along with long time Winfield resident Wanda Linder and other Sunrise Terrace leadership.